The one thing I do love about the slots developer iSoftBet is that not only are their non-branded slots well designed but they are also willing to bend the rules when it comes to themes in their slots. 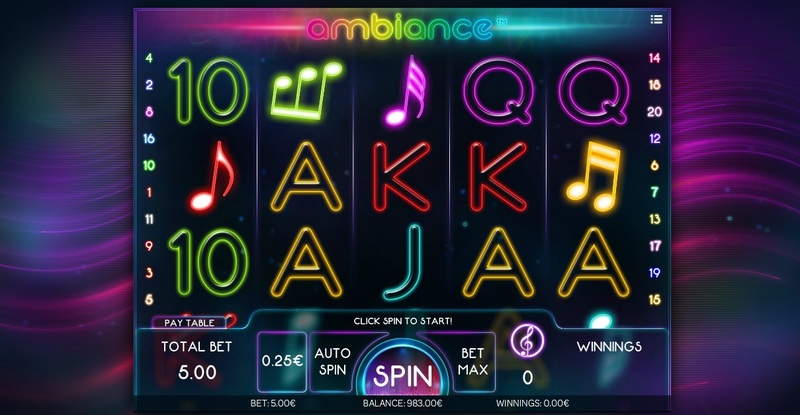 This particular slot is a music-themed title called Ambiance and it delves into a domain that is rarely covered by slots makers. 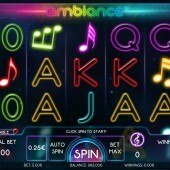 Ambiance is a 5 reel, 20 payline slot that offers you the chance to chill out and literally take in the ambiance. The whole vibe of the slot just feels like all it is missing is some Pink Floyd playing in the background with clips from the movie Dazed and Confused included when you hit some wins. The symbols on the reels consist of different musical notes presented in a neon tone. These notes include a quaver, demisemiquaver, sixteenth note, sixteenth note triplets, and an upside down beam. Forgive me if my reading of the notes is slightly off. It's been a while since I read music... by a while, I mean never! The remaining positions on the reels are filled up with the regular 10-through-to-Ace symbols. The Wild is represented by a multi-coloured graphic that looks quite cool. It has the power to replace any symbols, except for the Scatters, in order to help you complete any possible winning combinations that might have appeared on the reels for a single spin. The Scatters are also represented by a multi-coloured graphic with a treble musical note at the centre. If you hit five or more of these symbols across the reels then you will trigger the free spins bonus round. The number of free spins you earn will depend on how many Scatters you trigger the free spins with. In addition, any Scatters hit during the free spins will add free spins to your total. A little feature thrown into the free spins mix is the inclusion of Transforming Wilds. During the free spins, at least two symbols on the reels will turn into Wilds adding more opportunity for you to hit some winning combinations on the reels during the free spins. The whole atmosphere of this slot feels like a weird cross between NetEnt's underwhelming Sparks slot and the Elvis – A Little More Action slot by IGT. I am a big fan of music-themed slots and think there should be more out there. This slot does feel a bit boring at times but when it gets going the free spins can really bring the thrills to the game. It isn't iSoftBet's best release but it fills some time and looks stunning.